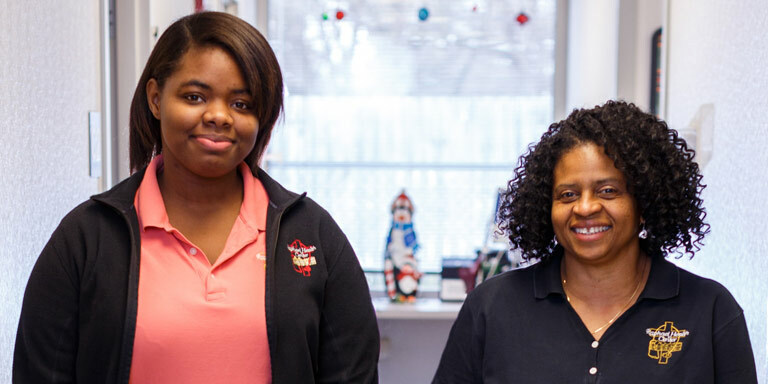 Brittany Alexander and Belva Wilkins play pivotal roles in educating Indianapolis mothers about infant mortality. With a presence on nearly every continent, the IU Center for Global Health at IUPUI makes an impact around the world and in our own backyard. In collaboration with experts in medicine, nursing, dentistry, law, social work, and public health, as well as student volunteers through organizations like Timmy Global Health and the Medical Missions Student Interest Group, the center’s cornerstone is AMPATH, the 26-year partnership among IU, Moi University, and Moi Teaching and Referral Hospital in Kenya. Researchers and health care providers work together in Indianapolis to apply lessons learned from mobile technology tactics developed and implemented through AMPATH in Kenya. WeCare Indiana aims to combat Indiana’s high infant mortality rate by connecting pregnancy coaches with women who are pregnant, postpartum, and of childbearing age through text messaging. The Raphael Health Center in Indianapolis is one of two project sites for WeCare Indiana. According to Dee Roudebush, CEO of the Raphael Health Center, “The WeCare Indiana program is so important because it helps women learn about infant mortality, how they can protect their children, and how they can keep their babies alive.” WeCare Indiana is just one way that IUPUI brings its global research home.